Phewf! Well, that was an intense week of listening! I’m going to hold my hands up shamefully admit that I’d held off from reading anything by the super popular author Liane Moriarty, simply because her fiction was so often labeled as chic lit. I conjured up aspersions of a bodice ripper type novel, empty angst or some other unfair generalization. Well, if this novel is classed as chic lit, then sign me the hell up! Big Little Lies follows a group of parents in a seaside Australian town. They have their rituals, meet at the school drop-offs, and have their cliques and issues. A new parent moves to town and soon makes fast friends, and indeed enemies. The novel starts off in an interview type manner, and we soon learn that something has happened at a school PTA quiz night. As we hear witness accounts of may or may not have happened that night, we are taken back to when Jane first arrives on the scene. What makes Moriarty’s novel such a hit, is not the plot; the plot, while good, is not one so unique that you wouldn’t ever see in a novel. No. Where Moriarty excels, is in her characters and their interaction. There is such razor sharp authenticity in how these parents and friends talk and act, that you really feel like you know them, and are there living with them. This is a brilliant novel that will keep you glued until the very end. 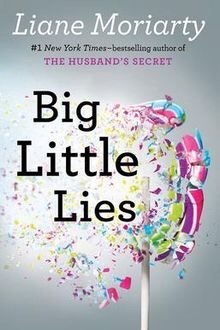 If you’ve yet to start reading Moriarty, then Big Little Lies is a great place to start.